Everything was great. Awesome view. Tasty breakfast in the room every morning. Michaeli the manager made our stay even better. Very friendly and attentive. Great vacation in this beautiful island. What wasn’t there to like. It was perfect, from the quality of the furnishings, the layout of the suites, the pool, the sun loungers, attentive and great house keeping etc etc. The breakfasts each morning were a feast, truly delicious. Each evening when coming back there would be another surprise in the fridge; cakes or home baked goodies and a digestif. Can’t recommend this place enough. Beautiful facility. Amazing view, very comfortable and quite . Staff is fantastic. I love that I could have breakfast when I wanted without time restriction. Onar Suites is a wonderful location with a breathtaking view above the cliff. It is unstressed and peaceul to lie down on the comfortable sunbed, to relax in the hammock or just to sit on the rocks and enjoy the beautiful view. For taking a little swim, you can choose between a private pool or just walk down to the beach on a small path . 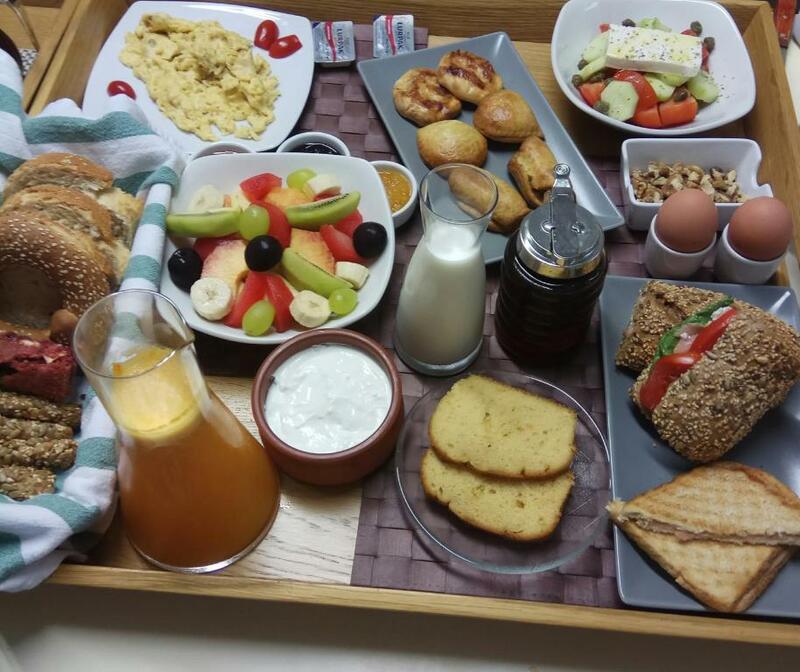 Warm hospitality and outstanding breakfast service will complete a perfect holiday. The location was amazing, the place was dreamy and very much comfortable and the people who welcomed us were great. Our time there was the best. We will defenetely go back. We loved everything! The wonderful breakfast, the view from our room, and Dimitra's warm hospitality. It felt like a home away from home. Wir wurden von Mr. Michalis sehr herzlich am Hafen Folegandros empfangen und zu den Suiten begleitet. Dort hat er uns sehr nützliche Tipps für Folegandros gegeben. Die Suiten sind sehr schön über dem Hafen gelegen mit super Aussicht. Uns hat es gefallen, dass es nicht in einem "Feriendorf" war, sondern inmitten von Häusern von Einheimischen. Die Suite ist sehr geschmackvoll eingerichtet mit schönen Materialien. Sehr genossen haben wir auch den kleinen aber feinen Privatpool vor dem Haus mit Sicht auf den Hafen und aufs Meer. Wir haben das exzellente Frühstück mit alles hausgemachten Spezialitäten sehr genossen. Je ne vais pas le cacher longtemps... Vous allez tomber amoureux de cet endroit et de l’île de Folegandros. La situation et la vue sont absolument phénoménales! C’est vraiment unique comme endroit... La maison comporte 3 suites (bientôt 5) et se trouve perchée en dessus du port. Devant la suite, piscine privée, terrasse avec abri et une grande place jusqu’aux falaises tombant à pique dans la mer (40 m de haut). À cet endroit, à 3 m du vide, 2 chaises longues avec vue imprenable sur la mer sur des dizaines de km. Incroyable! La suite que nous occupions est décorée avec goût et est équipée de tout le luxe nécessaire. Les matériaux choisis sont de qualité. Michaelis nous a accueilli au port et nous y a ramené. Il nous apportait chaque matin un déjeuner complet et abondant. (vous comprendrez en y allant). Dico solo che ho dirottato quattro giorni del mio viaggio di nozze a Folegandros dopo aver visto questa struttura e non potevo fare scelta migliore ! Ho scelto per noi la Suite Cardiothissa quella con la piscina , e ne siamo rimasti semplicemente entusiasti!!! Curato tutto nei minimi dettagli , design elegante e ricercato ,privacy assoluta , una vista da togliere il fiato !! Michalis , il manager ci ha coccolato ed è stato presente qualsiasi cosa avessimo bisogno , una persona veramente squisita ! Le colazioni sono magnifiche ed ogni sera al rientro trovavamo un dolcetto e un drink ( qui ci si rilassa e si ingrassa!! 😊) Coppie se volete qualche giorno di puro romanticismo venite qui!! La vista sulla scogliera e il mare tutta per voi non la scorderete mai!! 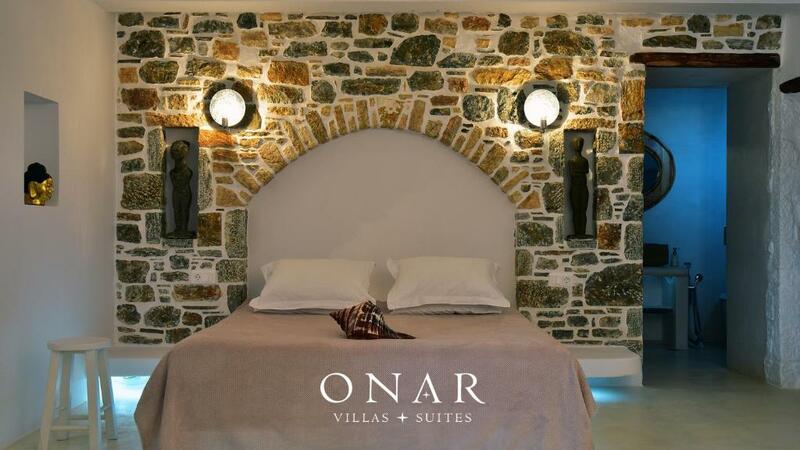 Lock in a great price for Onar Suites Folegandros – rated 9.6 by recent guests! One of our top picks in Karavostasi – and a guest favorite. Centrally located in Karavostasi, the Cycladic-style Onar Suites Folegandros offers elegantly decorated suites with unobstructed views over the Aegean Sea. It has a sea-view snack bar and offers free WiFi throughout. 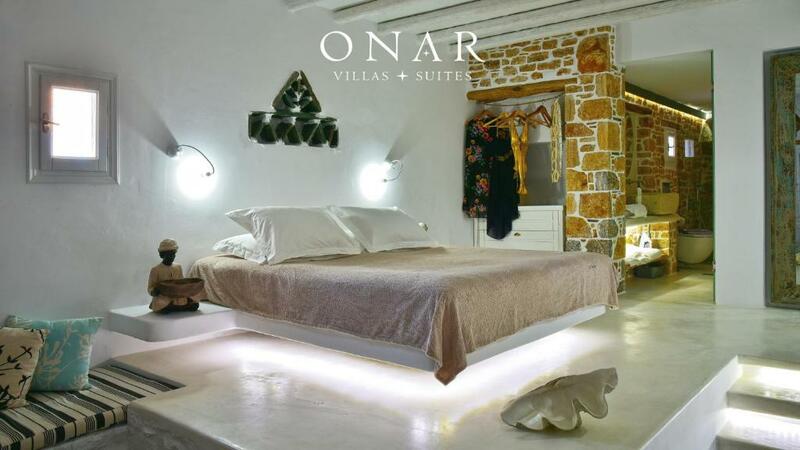 Opening to spacious, furnished balconies, the air-conditioned suites of Onar are fitted with traditional flooring, white furnishings and white-washed walls. Each unit has a seating area and a private bathroom with bath tub or built-in shower. Facilities include a mini-bar, a coffee machine, a flat-screen satellite TV, slippers and bathrobes. Guests can start their day with a continental breakfast served daily at the dining area or in the suites upon request. Restaurants, bars and mini markets can be found within 1,000 feet from the property. The port of Folegandros lies within 1,650 feet from Onar Suites, while Folegandros Town is at a distance of 2.2 mi. Agkali Village is 4.3 mi away and Ano Meria can be reached within 5 mi. Free public parking can be found nearby. 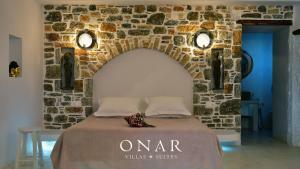 When would you like to stay at Onar Suites Folegandros? Elegantly decorated suite with a separate seating area and a spacious balcony offering unobstructed views over the Aegean Sea. It has private bathroom with bath tub or built-in shower, slippers and bathrobes. Facilities include a mini-bar, coffee machine, flat-screen satellite TV and free WiFi. Elegantly decorated suite with a spacious balcony offering unobstructed views over the Aegean Sea. It has private bathroom with bath tub or built-in shower, slippers and bathrobes. Facilities include a mini-bar, coffee machine, flat-screen satellite TV and free WiFi. Elegantly decorated suite with a separate seating area and a spacious balcony with unobstructed views over the Aegean Sea. 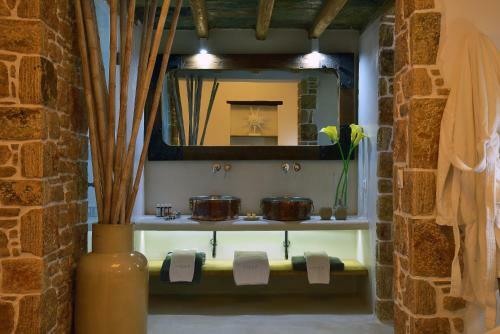 It has private bathroom with bath tub or built-in shower, slippers and bathrobes. Facilities include a mini-bar, coffee machine, flat-screen satellite TV and free WiFi. Designed by Heart... Built with Love! The basic meaning of creation derives by the person itself and its own lifestyle. Human and its structure, are controlled through documentation, which informs the brain and sets it in a pleasant mood. Onar was created under this logic and for that purpose. The human itself. Within these premises, documentation, will only send to the brain, positive messages, unique moments and beautiful memories. In this complex, consisted of three suites, the building and the decoration constitute a uniform set. The daily trip a person takes inside and outside of the suites’ premises is accomplished by relaxation, within the very own architectural space of each suite as well as on the unique terraces of the independent suites… gazing over the open sea. 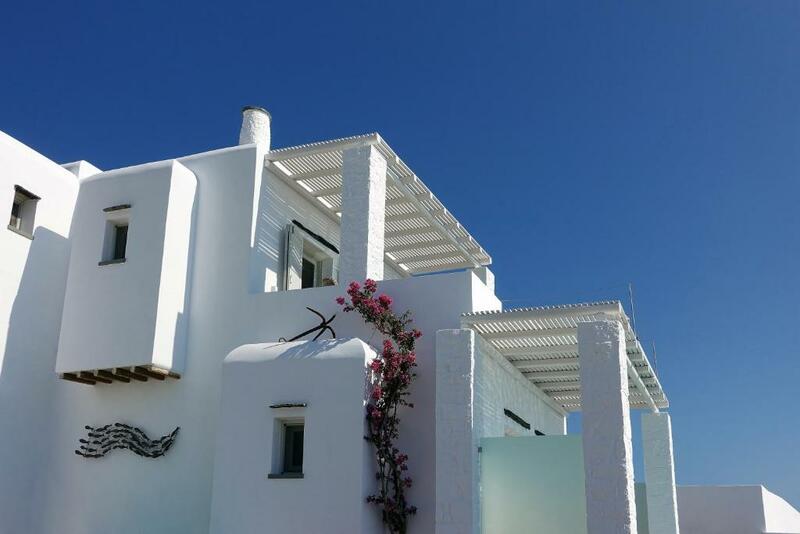 House Rules Onar Suites Folegandros takes special requests – add in the next step! 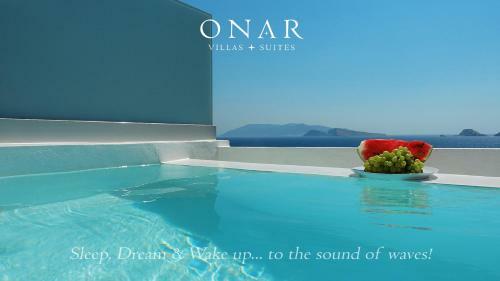 Onar Suites Folegandros accepts these cards and reserves the right to temporarily hold an amount prior to arrival. Please note that a free baby cot is available on request. Please note that an extra bed can be provided on request and at extra charge. Please inform Onar Suites Folegandros of your expected arrival time in advance. You can use the Special Requests box when booking, or contact the property directly using the contact details in your confirmation. Everything! Amazing food and staff. Very quiet. Everything! Best place we have ever stayed in. Amazing, hidden gem of the Aegean! Where do I begin? It's like your posh friends invited you over to spend some time at their humble(?!) abode! We spend 5 unforgettable days and nights at the superior suite! The room itself is absolute lush! With a traditional Cycladic bath carved out of the rocks, a bed that overlooks the Aegean Sea and a breakfast patio where we enjoyed probably the best breakfasts of our lives! 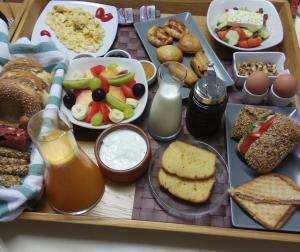 Mouthwatering local specialties freshly prepared for us when we informed Dimitra that we were ready to have our 'feast'!! Which leads me to our host Dimitra who is a combination of butler and manager but always Mediterranean style, meaning there when you need her but also inconspicuously taking care of you! She is the added extra of this place! The Balinese bed by the outdoor jacuzzi/ private pool is dreamy! We spend all our nights there gazing at the stars! And also the sun beds at the edge of the cliff with breathtaking views and tranquillity gazing at the Aegean Sea guaranteed an out of this world experience! 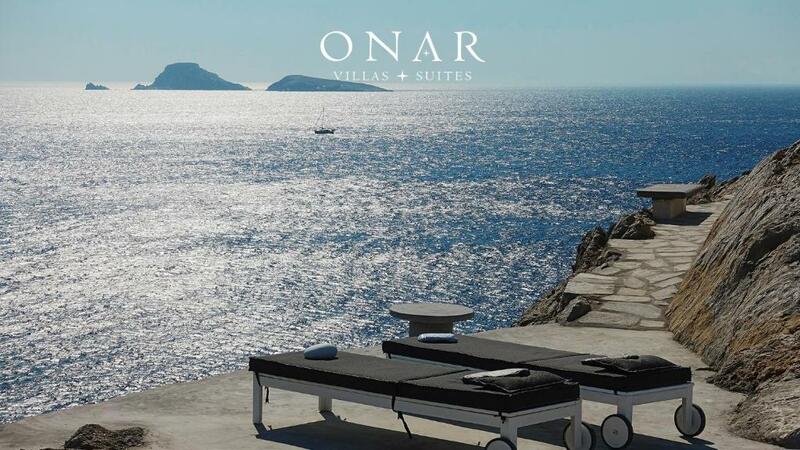 Finally, we have travelled a lot and stayed in places all over the world but the whole package of Onar suites folegandros is certainly up there in the top spots! We will definitely come back! There wasn't anything that we didn't like! A very minor detail, but a glass to hold the toothbrushes would be handy. not very good. I wanted to change the hotel every night. They don't have other hotel quality service. air conditioner problem(they fixed one day after but didnt work again) cleaning service, breakfast, not working tv(even the worker dont know how to fix it), water problem, basic facility and hard to communication with worker. You can stay with much cheaper and better service in other hotel. they only have 2or 3room in this suits so dont expect regular hotel service. you have to ask every little thing that you dont need to ask other hotel. one good thing is they have great sea view in front of hotel.